Kindly send me your booklet on "Child Care." Also any other booklets you have on children from 2 1/2 years old and up. Several of us women were discussing whether canned food (mostly fruits and vegetables) were good for children and we can't come to an agreement on it. What do your statistics show on this. Please answer me as I am very anxious to know. We are looking for an unbiased answer to the following question and feel that your department could supply the information which would not be influenced by paid testimonials nor prejudiced by tradition but based on actual facts. How do prepared baby foods such as Gerber's, Heinz's, Libby's, etc. compare with vegetables and fruits cooked at home under average conditions? Are they inferior, or on par, or superior? A definite opinion will be will very much appreciated. This information is in no way to be used for advertising but merely to settle a private argument . . . In the late 1920s and 1930s, dozens of women (and a few men) wrote letters to the federal government's Children's Bureau, asking for advice about the new canned foods for infants that were coming on the market. Parents wanted to know if commercially produced baby food was safe for their babies, if it was better than homemade, or if the bureau had instructions on how to can vegetables themselves for their infants. The documents reveal a transition occurring in infant feeding in the early twentieth-century United States: now that industrially produced canned baby foods were more affordable and more available on grocery store shelves, parents were feeding their babies more fruits and vegetables than parents had previously, and feeding their babies these solids at earlier ages. Until the late nineteenth century, infants were almost exclusively fed breast milk. But over the course of a few short decades, Americans began feeding their babies formula and solid foods, frequently as early as a few weeks after birth. By the 1950s, commercial baby food had become emblematic of all things modern in postwar America. Little jars of baby food were thought to resolve a multitude of problems in the domestic sphere: they reduced parental anxieties about nutrition and health; they made caretakers feel empowered; and they offered women entering the workforce an irresistible convenience. But these baby food products laden with sugar, salt, and starch also became a gateway to the industrialized diet that blossomed during this period. Today, baby food continues to be shaped by medical, commercial, and parenting trends. 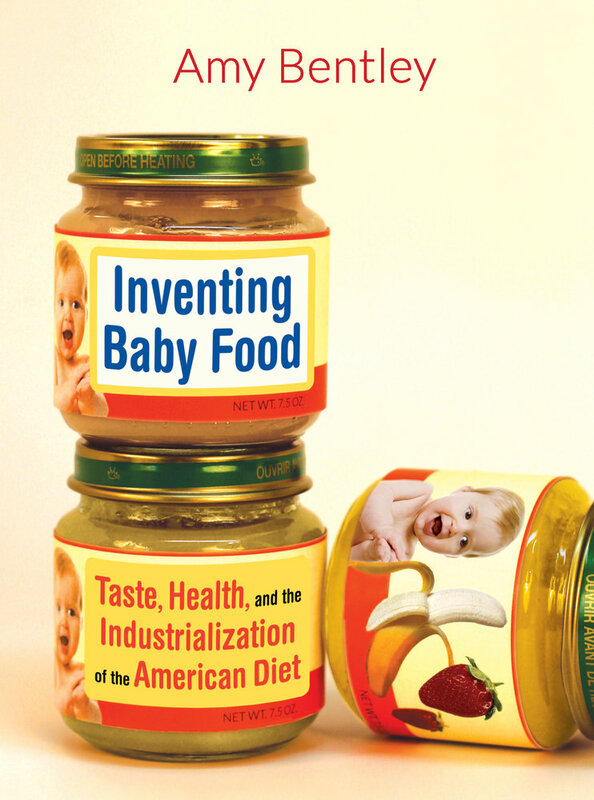 Baby food producers now contend with health and nutrition problems as well as the rise of alternative food movements. All of this matters because, as the author suggests, it’s during infancy that American palates become acclimated to tastes and textures, including those of highly processed, minimally nutritious, and calorie-dense industrial food products. Amy Bentley is Professor in the Department of Nutrition, Food Studies, and Public Health at New York University. She is the author of Eating for Victory: Food Rationing and the Politics of Domesticity and the editor of A Cultural History of Food in the Modern Era.